Israeli soldiers invaded, Wednesday, the southern area of Hebron city, in the southern part of the occupied West Bank, and fired gas bombs at schoolchildren heading to their educational facility. 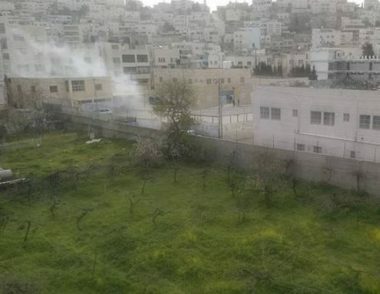 Media sources said the soldiers fired many gas bombs at students of Hebron Preparatory School for Boys, causing many to suffer the effects of teargas inhalation, and others suffered severe anxiety attacks. They added that the soldiers surrounded the school, and prevented the Palestinians from entering or leaving it, leading to the disruption of the school day, especially after the soldiers fired several gas bombs into the school campus. It is worth mentioning that the army repeatedly attacks the school, which hosts 370 students, and invades it, similar to violations targeting several other schools in Hebron governorate.